Derive the sum of the angles of a polygon by dividing the polygon into triangles and summing their angles. Vary the number of sides and determine how the sum of the angles changes. Dilate the polygon to see that the sum is unchanged. Exploration Guide reformatted and refocused for The Ontario Grade 9, especially the Applied. Original ExploreLearning Exploration Guide made more student-friendly by adding answer blanks. Students may use this data table to organize their measurements while completing the Gizmo. Also, allows ... (more)students to think about the concepts. There are two copies of the table on each sheet. In this lesson, students will discover the relationship between the number of triangles in a polygon and ... (more)the formula for the sum of the interior angles. A great lesson that allows students to discover the angle sum formula on their own. This Gizmo helps students to arrive at their own conclusions and the table maker helps them organize their data. 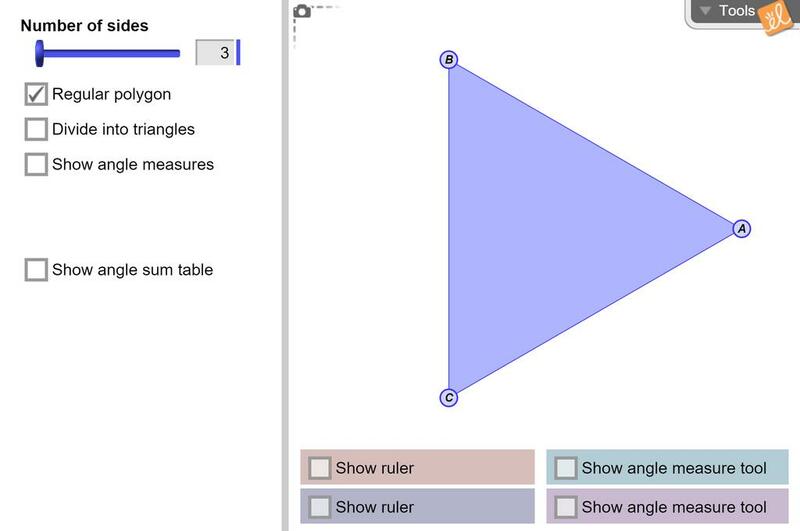 Get the Angle on Polygons! A great Gizmo that allows students to discover the formula n-2(180) on their own and lead to the "a-ha" moment.